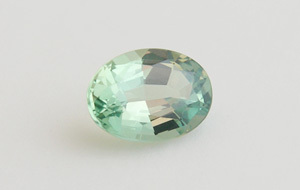 A green chromian variety of chrysoberyl; exibits a colour change in natural and artificial light. Named in 1842 by Nils Adolf Erik Nordenskiöld in honour of Alexander II of Russia. 1 specimen: 0288 — 0.50 ct, Brazil, Minas Gerais, Antônio Dias, Hematita.